Monica O. Montgomery, is the new Executive Director of Prince Georges African American Museum and Cultural Center. She is an arts and culture innovator using creativity and narrative as a means of bridging the gap between people and movements. As an independent curator, museum consultant and keynote speaker, she uses her platforms to be in service to society. 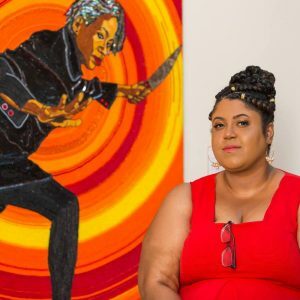 She is cofounder and strategic director of Museum Hue a multicultural platform advancing diversity, equity & inclusion initiatives for people of color, in arts, culture, museums and creative economy. She works internationally to facilitate diversity, equity & inclusion initiatives with clients throughout Europe, Africa and North America. 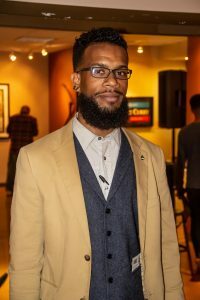 Treston Sanders serves as the Gallery Coordinator for the museum. He earned his Bachelor of Fine Arts from North Carolina A&T as a Visual Design major. A Greensboro, North Carolina native, he brings his lighting and design expertise to the museum. As a historian, teaching artist, and graffiti artist, he has trained under multiple curators and display specialists. Additionally, Treston has worked as an educator for the International Civil Rights Museum. Dr. Smith leads Museum workshops and programs based on her scholarly expertise and has developed content for educator digital resources. She curates our Culture Keepers Youth Exhibition and guides the process of developing presentations for the annual Youth Conference. She also serves as the Museum representative at on-site and off-site education programs. Dr. Smith has a Ph.D. in Global and Sociocultural Studies with a concentration in Anthropology from Florida International University. Her research focuses on identity construction through performance, particularly as it relates to black popular culture. She has also developed a strong interest in globally-conscious community engagement, and strives to cultivate a generation of cultural ambassadors through her work with youth from different backgrounds. content, implement digital and media strategies, build relationships with partner organizations, and facilitate a range of promotional campaigns designed to increase positive brand awareness and social media presence. 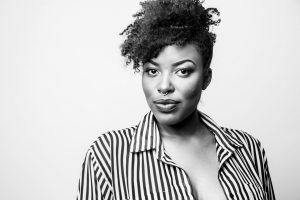 Tomora Wright is a Advertising graduate from Howard University and pursuing her MA degree in Art Management at American University.